Percent change of the indicator. WASHINGTON (MarketWatch) – Demand for U.S.-made durable goods rose a seasonally adjusted 0.5% to $178.1 billion in February, the third straight increase in a key forward-looking indicator, according to Commerce Department data released Wednesday. New orders for machinery and civilian aircraft were strong in February, while new orders for autos, defense goods and electronics declined. The 0.5% increase in durable goods orders was weaker than the 1.7% gain expected by economists surveyed by MarketWatch. However, January’s orders were revised higher, from a 2.6% gain to 3.9%. December’s orders were also revised higher. 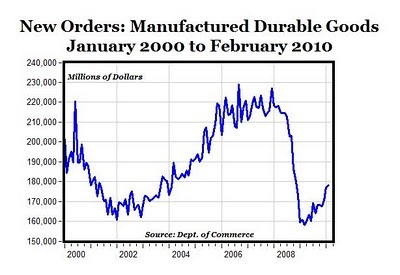 MP: New orders for durable manufactured goods in February reached the highest level ($178.1 billion) since November 2008 (see top chart above). The 12-month percentage change in February of 10.9% followed an 11.9% increase in January, which was the highest annual increase in new orders for durable goods and equipment from U.S. manufacturers since September 2006, more than three years ago (see bottom chart). The last time there were two consecutive double-digit monthly increases in durable goods orders was four years ago in the spring of 2006. 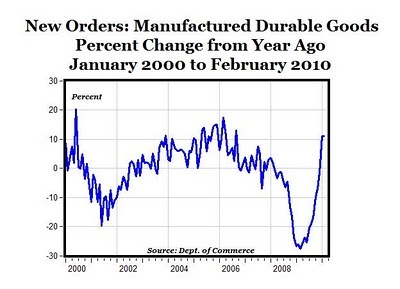 Add this to the growing list of V-shaped signs of economic recovery, especially in the U.S. manufacturing sector. This entry was posted on Wednesday, March 31st, 2010 at 5:47 am and is filed under Front Office. You can follow any responses to this entry through the RSS 2.0 feed. You can leave a response, or trackback from your own site.